Managing Diretor Ashwini Bhide given hearty congratulation on getting 17 Tunnel Boring Machine for Mumbai Metro Line-3. Mumbai: Mumbai Metro line-3 gets all 17 Tunnel Boring Machine (TBM) in India. Now 16 TBMs are in Mumbai and one will arrive from Delhi in 3rd week of August 13 TBMs already in action. Second TBM of package 1 (Cuffe Parade-Hutatma Chowk) arrived at Mumbai Port. 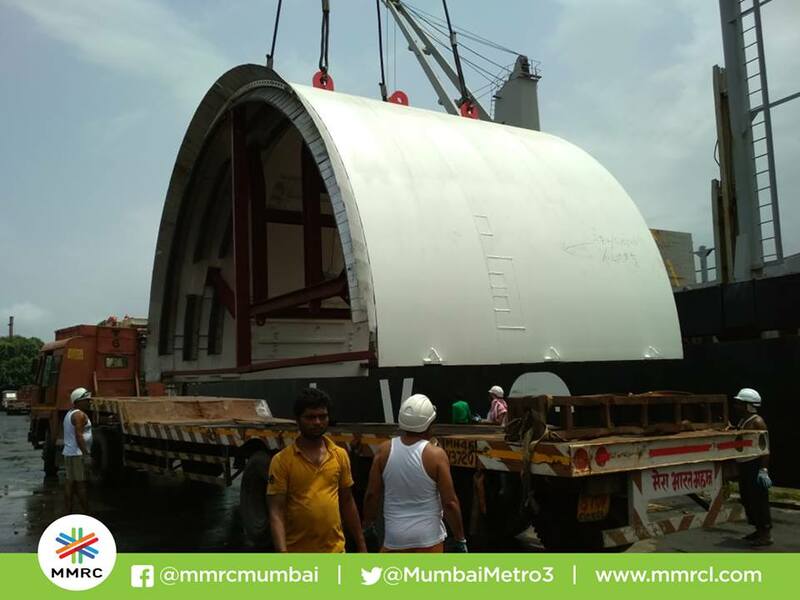 TBM Surya-2 manufactured by Robbins Company approximate weighing 700-800 tonnes with a diameter of 6.65m, 98m long, will connect the areas between to Cuffe Parade to CST. Managing director of Mumbai Metro Ashwini Bhide congratulated on this victory on her twitter account. The 13th TBM of Mumbai Life line is commissioned to build down line tunnel of 567 mts from Sariputnagar to SEEPZ Station. Mumbai Metro line-3 also referred to as the Colaba-Bandra-SEEPZ line. This is a part of the metro system for the city of Mumbai. The metro line-3 will connect Cuffe Parade business district in the extreme south of the city to SEEPZ in the north-central with 26 underground and one at grade station. Mumbai Metro Rail Corporation Limited (MMRCL) is implementing the project. This line will cover Nariman Point, Churchgate, CST, Girgam, Worli, Dadar, Mahim, Kalina University, Bandra, Bandra-Kurla Complex, Santacruz East and past the domestic and international terminals of Mumbai Airport, through Andheri MIDC and terminates at Seepz. Previous articleHigh Speed Rail | BEML awaiting for clarity on indigenization of Bullet train.